Welcome to week 4 out of 8! I am going through dog breeds, covering some basic titbits about the breeds. This will be in between other posts too. This, the fourth, post will cover J-L of dog breeds. In previous posts, A-C, D-F and G-I have been covered. Original Use: Small game hunting in the mid-1800’s. Originally bred by, and named after, Reverend John Russell. The variation in breeding throughout later years making the breed more diverse – smooth coat, wire coat, long and short legs. 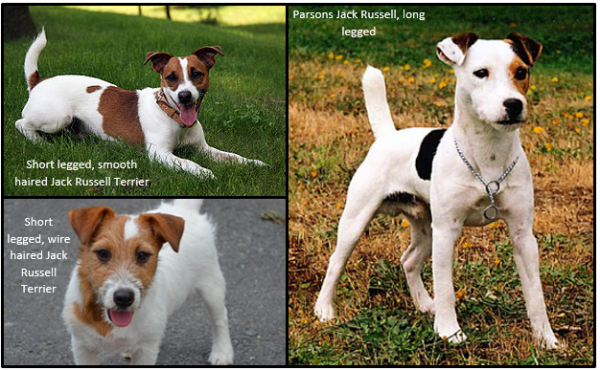 The long legged Jack Russell has become known as the Parsons Jack Russell, and was bred to hunt slightly larger animals (such as foxes and badgers) – the longer legs helping them to keep up with the bigger animals they were hunting. Outstanding Physical Trait: The diversity in the appearance in this little breed, but with key similarities too! Both breed types can be short coated, long coated, smooth coated, wire coated; then long or short legged – whichever combination, the looks can be quite different – but still really adorable! Original Use: Royal lap dog; companion animal. This breed is quite delicate though, and unsuitable around small children as they can be a bit rough and damage this little dog quite easily. This little breed has been depicted with nobility and royalty in pictures dating back as far as the 17th Century. Outstanding Physical Trait: Their long, flowing, silky coat gives them a regal look (which would have fitted in with the nobility they were bred for). The long tail fur flows down when the tail is down, in silky waves; when upright, the tail fur spreads out, fanning around the end and flowing over the back of the dog. Country of Origin: Ireland (County Kerry, in the South-West of the Republic of Ireland; contributing to the breed name) in the 1700’s. Brought to Europe and America in the early 1900’s. Original Use: Hunting small game, and retrieving from land and water. Also used for hunting vermin. Used as well for herding sheep and cattle. Outstanding Physical Trait: Although born black, the coat takes on a blue colouration as the dog matures (contributing to its’ name); it is tightly curled and does not shed. The Kerry Blue Terrier has quite lengthily facial fur, coming down around its muzzle like a long beard or a bit of a funky moustache! This is quite a distinguishing feature of the breed. Original Use: Guarding livestock – with the large size and the strength, it was quite adapt for this role; also having its’ big, thick coat to keep it warm whilst guarding out in fields. It has been said to be capable of taking out predators such as wolves and bears, when guarding herds and flocks. Outstanding Physical Trait: The mega funky fur! The fluffy brushed-out fur or the striking dreadlock look! This dog has amazing fur, but it does take a lot of grooming and up-keep! 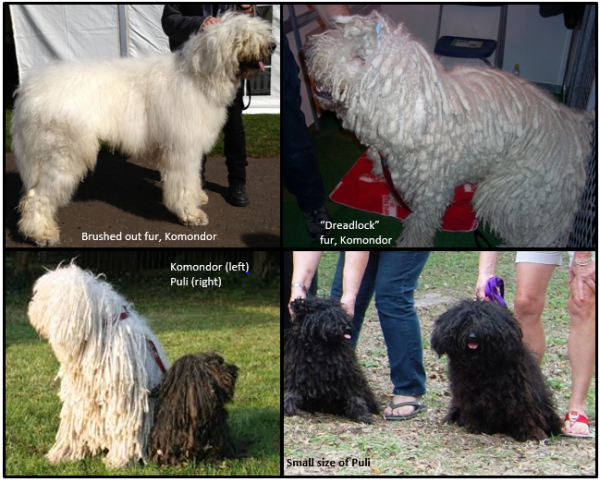 It looks very similar to the Puli, a smaller breed that also has the dreadlock look (and also from Hungary); this breed colour ranges from light to dark (more often being dark), whereas the Komondor is always of a light colouration. The Puli also has a longer lifespan than the Komondor. Country of Origin: Canada – the Newfoundland and Labrador regions. Original Use: The retriever as we know today was originally bred and used for retrieving (big surprise) game; used as gun-dogs to retrieve the small game (often birds) from where they fell after being shot. However, it is said to be derived from a breed used by fisherman for hauling nets – St. John’s Dog a.k.a. Lesser Newfoundland. This dog was used to produce retriever-like dogs and is an ancestor to modern day retrievers (Labrador, Golden, Flat-coated, etc). Outstanding Physical Trait: This breed does not really have anything outstanding about it physically – it has short, smooth fur; slender bodies, legs and tails; floppy ears; and lovely faces. Original Use: Bred by Tibetan monks as a watch-dog for the monasteries. Kept by the monks and by Tibetan nobility. Now it is kept as a companion dog, and is often shown. They are loyal, friendly dogs when properly trained – however they can be quite iffy with strangers, which is a good attribute for a watch-dog! Lhasa’s were not sold, if you wanted one it had to be gifted to you – the spreading out of this breed across the world was in the form of gifts, usually from nobility to nobility. Outstanding Physical Trait: The long, flowing, silky coat of the Lhasa gives it a look that fits in with nobility. The fur is very straight and needs often grooming to keep it in tip-top condition. Original Use: Bred by the mayor of Leonberg, in 18040 – Heinrich Essig, to honour the town. Bred purely because Essig wanted to create his own breed. It is a good guard dog, and over the years has often been used a such. Outstanding Physical Trait: This breed is tall and well built. They have big, expressive faces and a long, thick coat. The coat is so thick it sheds very heavily twice a year, and moderately throughout the rest of the year – so expect fur carpets 😉 if you own this breed!